"Dr. Wily has broken into the Chronos Institute and stolen the experimental Time Skimmer. We tried tracking him on radar, but he simply vanished. My calculations show that he jumped approximately 37.426 years into the future. I have no idea what he plans to do, but you can be sure that he'll be back! "In the meantime, Rush has sniffed out a few of Wily's robots guarding a subterranean passage. Get over there and check it out. And remember, let's be careful down there! --From the Gameboy Mega Man 2 instruction manual. Save the world by defeating all the robot bosses and capturing Dr. Wily. Mega Man 2 for the Game Boy is much like its counterpart for the NES. Dr. Wily is at it again. This time he has better robots and a few new tricks up his sleeve, but this will not stop our hero, Mega Man, from winning the day. Mega Man does not have the ability to charge his Mega Buster, but he is still no one to mess with. The controls for the game are fairly nice and the graphics are good for a hand held system. The gameplay for Mega Man 2 for the GB is very close to the NES version and was a good addition the series. 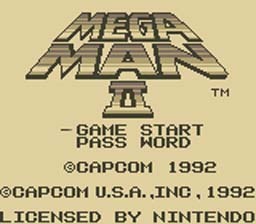 So grab a controller and give Mega Man 2 for the GB a try. Enter A1/3/4 B3 C1/2/3 D1/3 as a password.